I just found this and thought it went well with the Pete the Cat shoe tying club. 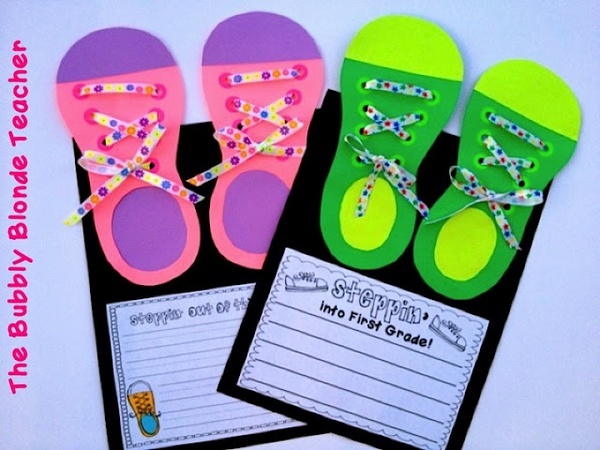 Instead of using it as a "stepping into first grade" writing activity, you could have students make the craft and do some writing when they make the shoe tying club. Of course, it is super cute no matter how you want to use it!! For more information about this unit, visit The Bubbly Blond. Cute idea Jennifer! Thanks for sharing it!! Yes!! This is so adorable to go with the Pete activity! Thanks April!! The shoe tying club is a great idea!! Thanks for sharing! I saw someone else post a similar idea under a pinterest post of it. I will update the unit with sheets to go along with Pete and tying shoes:) Never thought about that!